Social media fails are all the rage these days with every big brand seemingly trying to outdo the last. Almost exactly one month ago today, Woolworths published a Facebook post inviting followers to finish the sentence, ‘This weekend, I can’t wait to ______’. It backfired, with disgruntled comments taking over covering topics ranging from the rise of private labels to digs at the freshness of Woolies’ vegetables. Having run several previous ‘finish this sentence’ posts on its Facebook wall that ran completely smoothly, Woolworths could have just chalked it up as a lesson in the unpredictable nature of social media, and they’ve no doubt learnt from it. 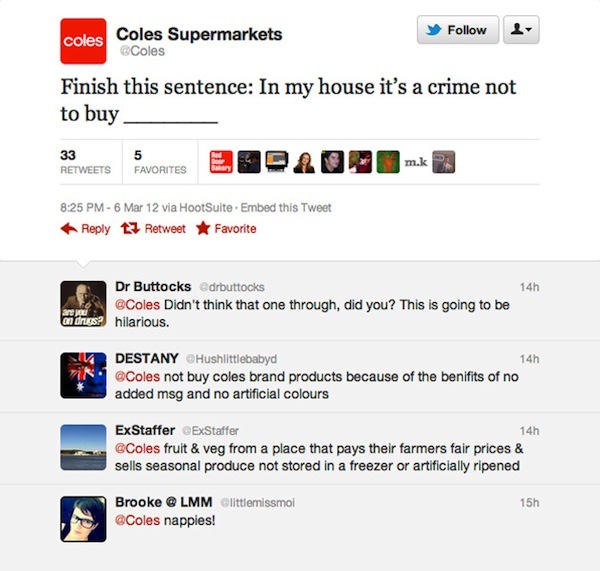 One organisation that hasn’t learnt from that incident, however, is Coles, who ran essentially the same gimmick last week, and immediately felt the burn. While entertaining to watch from afar, the seemingly endless supply of brand social media fails raises the question of whether it’s just the nature of the social media beast, or if marketers need to think harder and smarter about how they try to drive engagement with their audiences on such platforms. Image: Pedestrian.tv, click for more.